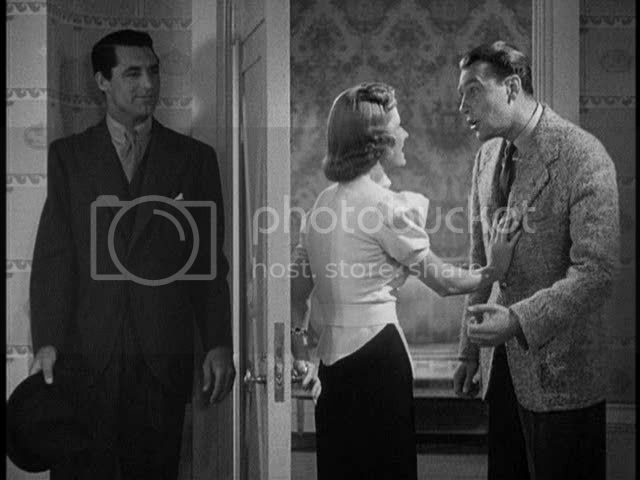 Leo McCarey's The Awful Truth is a film about doors opening, and doors slamming shut again. It's a strange thing to say about a 30s Hollywood comedy whose premise is the pending divorce of a couple who suspect each other of unfaithfulness, but it's also a wonderful metaphor for the film's focus on shifting relationships and options developing and being closed off. This comedy of entries and exits begins when Jerry (Cary Grant) returns from a fake trip, having used a tanning lamp to lend his story of a Florida vacation some plausibility, to find that his wife Lucy (Irene Dunne) is not waiting around for him as expected. Instead, she's out with her "voice instructor" Armand (Alexander D'Arcy), a situation that causes Jerry considerable suspicion  not to mention embarrassment in front of the friends who witness his wife's return with the suave European. When Irene catches him in his lie about Florida  it's never explained just what he was doing instead  the couple decides that their mutual distrust is too much to bear, and call it quits. The only dispute arises over the possession of their dog, Mr. Smith; the divorce seems agreed-upon otherwise, and they only have to wait 90 days for it to become final. Of course, this being a Hollywood film, things don't end there, and it's instantly obvious that the couple is going to have to get back together by the end of the film. This is a staple of 30s Hollywood, the divorce comedy that allowed filmmakers working under the restrictive Hays Code a bit more leeway in regards to issues of sexuality, infidelity, and innuendo. After all, the couple starts the film married and ends it married; where's the harm in a little fun in between? The pleasure here lies mainly in Grant's performance, as briskly funny and broad as any he ever gave, a smooth continuation of his deft turns in countless other light screwball comedies of the era. He is, as always, quick-witted and always up for a bit of verbal sparring, though he's by no means given as much to do on that front as he does in, say, the Howard Hawks farces he starred in, where his nonstop barrages of wordplay were half the fun. Dunne, though she turns in a decent performance, clearly wouldn't be up to that task anyway; she's no Katharine Hepburn, for sure. Her verbal style is much more suited to laconic one-liners, drawled out of the side of her mouth with barely contained sarcasm layered on. In this capacity, she provides some of the film's funniest jokes, like her response to Armand's line about being "a great teacher, not a great lover," as he tries to deflect Jerry's anger. "That's right, Armand," she says, "no one could ever accuse you of being a great lover." In the scenes where she aims for a more breezy style, though, it simply sounds forced and mannered, like a would-be screwball telephone call where Dunne's running commentary on Grant's conversation with his fiancée just isn't as funny as it could've been. The film fares better, in general, when it sticks to more physical comedy, which is not to say slapstick necessarily, since the film's slapstick scenes, involving Grant falling off a chair or (bizarrely) performing judo with an Asian butler, are similarly flat. But there's a wonderful sequence in the middle of the film centering around Dunne's apartment and the series of entries and exits that a trio of men make from her chambers. First, Dunne's conversation with Grant is interrupted by the arrival of her fiancée Dan (perpetual bumbling straightman Ralph Bellamy, hilarious as an Oklahoman good ol' boy), necessitating a wonderful scene where Dunne has to desperately juggle with a door, Bellamy, and the teasing pranks of Grant, in order to keep the two men separate and Grant hidden. Director McCarey films this scene from within the room, subtly keeping the focus of the shot on Grant's smirking face, even as he remains silent throughout the scene while Bellamy and Dunne exchange dialogue. This shot epitomizes the film's use of doors as boundaries that can both separate and reunite. As Lucy's Aunt Patsy (Cecil Cunnigham) says later in the film, "Every time I open this door, someone walks in." It sounds like a truism, something so simple it hardly needs comment, but the fact that she does comment, in a film where doors are of such crucial importance, only underlines the way doors dictate the film's relationships. Here, the door keeps the two men apart even as it subtly connects Dunne and Grant, especially once Grant starts playfully poking her under her arms, tickling her in order to get her to laugh at Bellamy's earnest love poem. The door defines this romantic triangle and its sexual ground rules: Grant, the current husband not yet divorced, is already inside, while Dunne is trying to keep Bellamy, the interloper from outside, from, ahem, crossing her threshold (a metaphor used even more blatantly (and hilariously) by Hitchcock, in The Trouble With Harry). Another door, also in Lucy's apartment, instead of keeping two men separate, unites them in an unexpected context. Not long after the previous scene, the focus of the film shifts to another door within Lucy's flat, no longer her entryway but an interior door leading to a guest room. This is the room where she hides Armand when Jerry unexpectedly arrives to talk to her, and it's the same room that Jerry flees to, over Lucy's protests, when Dan shows up not long after. This leads to one of the film's finest brief scenes, and the most fun Grant moment here, in a completely silent pantomime routine worthy of the best silent comedy. Grant enters the room with the startled D'Arcy standing behind him, unseen at first. Grant leans over at the door, listening in on the other room, then suddenly senses a presence behind him and slowly turns around, taking in the shoes first and letting his eyes make their way up to the head of the despised "voice instructor." D'Arcy then shuffles his feet and flutters his eyes, a swarthy European version of a Chaplin impression, while Grant smirks knowingly and hands the other man his hat. 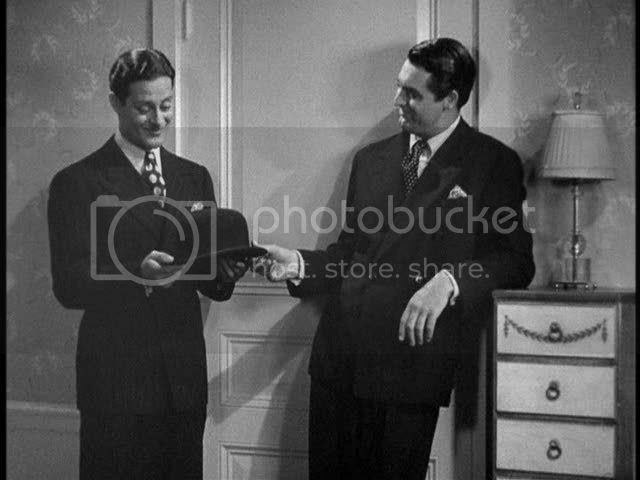 The two actors say it all through body language, and McCarey cuts it off after this, shifting to the parlor outside where we can only hear the rest of the scene playing out, in loud crashes and yells. This is one of a few great scenes where McCarey plays with the kind of layered soundtracks that Hawks' screwball comedies would make so famous and use so liberally. The noise from the background almost completely drowns out the innocuous conversation going on outside, a trick that's even funnier in the scene where Bellamy and Dunne attempt to flirt while in the background, Grant pounds loudly on a piano, accompanied by the "singing" yelps of his pet dog. The film's final scene also contains the final of the three doors that play so pivotal a role in the film's shifting relationships. The location of these doors has shifted even as their meaning within the film has, and the final door of importance here is, naturally enough, a bedroom door, the final degree of intimacy in the progression from entryway to guest room to boudoir. The film's last scene, following on a twenty-minute tour-de-force in which Dunne has cleverly cajoled Grant into accompanying her to a country cabin, uses the door as a tangible indicator of the couple's growing indecision about their divorce. They begin the scene bedding down for the night in separate rooms, divided only by a creaky door with a broken lock and a loose fitting, so that it shakes and occasionally blows open in the night. This results in an extended sequence in which the lovers are hidden from each other, fretting alone, for some time before the door blows open, thus joining them together again. McCarey inevitably films the door's opening each time from Dunne's room, and the doorway creates an expansion of the cinematic space within the frame, deepening the shot as it peers through the now-open door and into Grant's room. It's a clever way to make physical the couple's rekindling connection, and Dunne makes the scene's sexual overtones even more apparent as she hams up her hints for Grant to come to bed with her. With raised eyebrows, meaningful glances, head nods, wink-wink, nudge-nudge, she all but tells him to come and get it, an implication previously hinted at in the scene where she rides on a policeman's motorcycle, bouncing up and down in front of the visibly embarrassed cop, using her rear to make his horn go off (oh my!). One guesses all this subliminal naughtiness passed by unflagged only because the couple in question was already married, if not quite happily married. The Awful Truth is a solid screwball farce that only gets stronger as it goes along. After a relatively flaccid, slow-paced first half, the film begins to really pick up speed once Bellamy's drawling oilman is on his way out, and Grant gets much more to do once the comedy of doorway dalliances begins in earnest. The final half-hour is a masterpiece of romantic comedy, encompassing Dunne's hilarious performance while pretending to be Grant's drunken, striptease-performing sister, and the sweetly, subtly funny finale at the cabin. The film works, not only because of Grant's masterful performance, but because McCarey continually finds fascinating ways to visualize the rather stock situation here, a love triangle (or quadrangle) that must eventually resolve itself in the only way possible from the very beginning, given the mores of the time. Never mind that, in the film's marriage, Lucy is not really unfaithful to Jerry, while Jerry quite possibly is unfaithful to her. In a true Hollywood double standard, notice that the woman must explain the inconsistencies of her story, convincing her husband that she did nothing wrong, while the husband's lies are quite literally forgotten. No one ever mentions Jerry's fake trip to Florida or what he really did again. "Things are just the same as they always were, only you're the same as you were too, so I guess things will never be the same again," Lucy says in the final scene, a clever tongue-twister that also suggests both the film's roundabout return to the status quo, and the Hollywood morality secretly governing this story of a marriage lost and found anew. I absolutely adore this film and the point you make about doors is well taken. But to me it's a kind of ballet with Grant as Astaire and Dunne a racalcitrant Rogers. I really like her style in this and don't have the problems with it you do. But it's the sort of thing that can't really be argued critically. She just cracks me up all the time. Bellamy is adorable, and Asta is beyond brilliant as Mr. Smith. What would the 30's have been without him? As for Grant, he is quite simply the greatest actor the cinema has ever known. Since you are an admirer of Paul Verhoeven, i would like to know your opinions (in the form of a review, if its possible) on Basic Instinct - the movie that propelled him to international stardom & notoriety. i know its a Hollywood movie, & hence not in the same pedestal as the more esoteric films & classics you cover. But it sure deserves attention (& not just for Sharon Stone). If not anything, Verhoeven will always be remembered by this movie, even though it wasn't his most critically acclaimed work. Unfortunately i haven't watched The Awful Truth. Hence, my apologies for my my comment not being relevant to the review you have posted.